When it comes time for you to get down on your knee to propose, or surprise your loved one with a beautiful diamond, you want everything about that moment to be perfect. Buying a diamond can seem like a daunting task but understanding a diamonds characteristics is simple, all you need to know the 4C's: Cut, Color, Clarity, Carats. There are six grades of cuts; excellent, very good, good, fair and poor, which measure the diamonds light performance; how much light reflects out of the top giving the diamond more sparkle vs. how much light escapes through the bottom or sides dulling the stone. A good cut diamond showcases the stones color and draws attention away from the flaws, it makes the diamond symmetrical and proportionate. The color grade refers to the whiteness of a diamond. The diamond scale starts with "D" being colorless and goes down to "Z" meaning noticeable color. XO Gems tries to keep all engagement ring diamonds "I" or above. It is very common to see diamond color grades "H-J" in diamonds set in pendants or earrings but the farther away from "D" the more yellow or brown a diamond can look. "Fancy Color" diamonds are diamonds that are colored, often canary yellow or blue. These diamonds are graded in a different manner then diamonds that are in the colorless family. This is another important quality to look for when buying your perfect diamond. Diamonds can have internal characteristics, also known as inclusions, as well as external characteristics that are known as blemishes. A flawless diamond, one that has neither inclusions nor blemishes, is very rare. When a grader looks at clarity, he uses magnification and specific lighting to determine the diamond's clarity grade based on the particular characteristics he or she sees. Clarity is least likely to impact the cost of a diamond so look for a diamond that has no imperfections visible to the naked eye. Carats are the units of measurement that are used to determine a diamond's weight and estimate its size. This is why two 1 carat diamonds sitting next to each other can look different sizes. 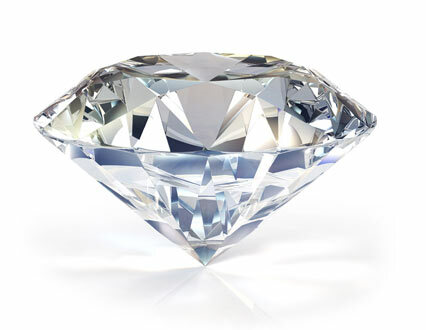 Some cut diamonds can have a larger surface area while others are a lot deeper. Look for a diamond that has a highly scored cut so it is proportional in size. It is always a good idea to compare diamonds side by side, measurement by measurement, so you can see exactly what you are getting.